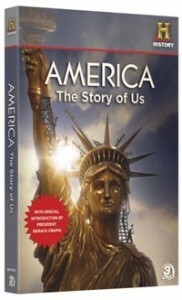 The critically acclaimed documentary TV series America The Story of Us , produced by the History channel, was released on DVD and Blu-ray on Sept. 14, 2010, from A&E Home Entertainment. America The Story of Us aired on television to 6 million viewers, making it the most watched premiere in network history. It was broadcast with an introduction by President Barack Obama, and that introduction is included in the DVD and Blu-ray release. 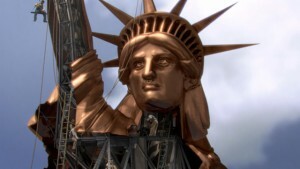 The documentary show looks at such historical events as the arrival of the first English settlers, the Revolutionary War, westward expansion, the Civil War, the development of industrialized cities, the California Gold Rush and the Great Depression, as well as such human progress as the railroad and putting a man on the moon. The series includes CGI effects, such as the creation of the Statue of Liberty, the meteor crash that created the Cumberland Gap and the British Navy’s bombardment of the New York Harbor at the start of the Revolutionary War. And, America The Story of Us offers interviews with members of the media, politics, business and entertainment, including Brian Williams, Buzz Aldrin, Colin Powell, Donald Trump and Michael Douglas. The 12-part, nine-hour 12-minute series is available in three-disc sets on DVD or high-definition Blu-ray, priced at $39.95 and $49.95, respectively. America The Story of Us also was made available for digital download on iTunes, Zune Video Marketplace and the PlayStation Store the same day, and a 412-page companion book also was released. Does this brings any subtitles english or others? I don’t think there are subtitles on this one….